Ramblings of an Opinionated Bong...: How will Suarez fit in to the current Liverpool lineup? I am a sports enthusiast, who has an opinion about most things. This blog is an opportunity for me to express those opinions, and hopefully get into conversations with like-minded people. If you like the content that is posted here, please help share it. How will Suarez fit in to the current Liverpool lineup? Liverpool will be facing Manchester United in the Third Round of the Capital Once Cup later tonight, and it will mark the return of Luis Suarez from his ten-match suspension for biting Chelsea defender Branislav Ivanovic towards the end of last season. Liverpool, will no doubt welcome him with their arms wide open, especially considering that their juggernaut of four consecutive wins in the league and cup have been halted by a draw at Swansea and a defeat to Southampton at home. Liverpool put in a disappointing display against Southampton, and in the absence of Philippe Coutinho, out due to a shoulder injury sustained against Swansea, the team seemed bereft of ideas, and failed to break down a disciplined Saints outfit. With the constant pressing from Mauricio Pochettino's, Liverpool's creative players never had the time to look up and find a defense-threading pass, and hardly any clear-cut opportunities were created. Coutinho's vision and flair were sorely missed, and in his absence, summer signing Iago Aspas underwhelmed yet again; the team was crying out for a player who could slice open the defense with a swing of his boot. "If you look at the results, Liverpool haven't really missed him and that is a testament to Sturridge and Coutinho," former Reds forward Robbie Fowler told BBC Sport. "But that's the good thing about Liverpool, they have a world-class player waiting in the wings. 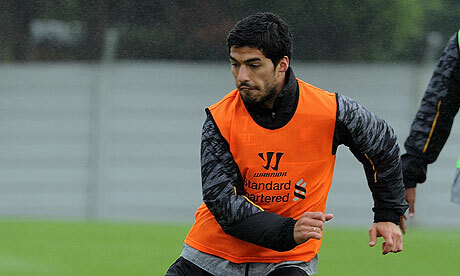 It will be baptism of fire against United but I think Suarez wouldn't want it any other way." Suarez's return will be the boost that Liverpool manager Brendan Rodgers sorely needed. His ingenuity on the ball, and the ability to create something from nothing will be essential when Liverpool take the field against a wounded Manchester United side, who themselves were humiliated in the derby against cross-town rivals Manchester City. The focus will be on him for a multitude of reasons, not least the sour relationship he has with Manchester United. The controversial forward is under pressure to restore his reputation after the ugly biting incident that led to his latest suspension, while he has plenty to prove to Liverpool fans and bosses after declaring his wish to leave the club. So, with Suarez's return so eagerly awaited, the only question is where will he slot in to the side? Daniel Sturridge has been superb since he joined from Chelsea last January and this season he has continued his fine form. Dislodging him from the starting striker berth would be unfair and it looks like Suarez will have to work his way into the team from another position. Given Suarez’s supreme talent as a player it would appear feasible that he could do a job in any of the three attacking midfield positions. Suarez will most likely play just behind central striker Sturridge, in the role that Coutinho had been playing before his injury. Playing in the hole between the defense and midfield will give Suarez time on the ball and allow him to run at the United defense. However, he will be far more mobile than Coutinho, and he offers a more physical presence in that area and will not be pushed off the ball as easily as the Brazilian. Sturridge will drift out to the right side, drawing the defenders with him and creating space for Suarez to run into with the ball at his feet. Henderson will drift inside to the center of the park to provide the passing option for the wide players. The fullbacks will play a crucial role, and will have to push up and provide width in order to stretch play, and create more spaces between the defenders for Suarez to attack. At the same time, Suarez may drift out to the left side of the attack, and target the right back, which is likely to be a weak spot for United today. Moses will naturally have to switch to the other wing to provide balance, and Henderson will move infield at the head of the midfield trio. When Suarez does decide to take on the full-back, Sturridge can drop deeper to fashion a shooting opportunity for himself from outside the box, something that he has done expertly this season. Henderson has the ability to make the darting runs into the box, but he may be equally effective with an overlapping run on the outside as this may help draw the midfielders who would likely track the Uruguayan. 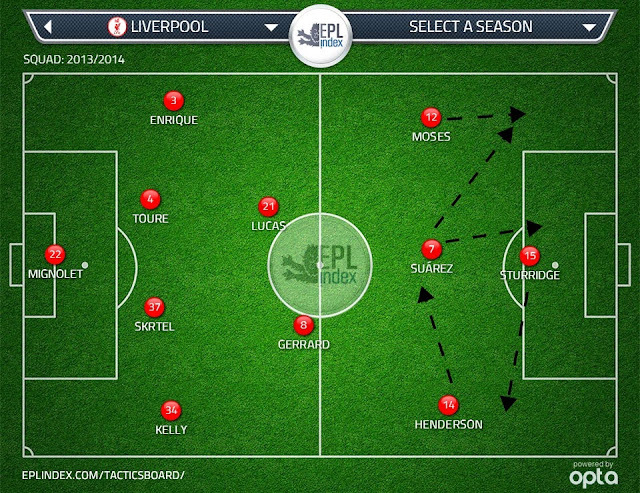 Suarez’s return does throw up is the possibility for some serious interchanging from Liverpool’s front quartet. Steven Gerrard and Lucas Leiva have become very solid fulcrums for the attacking talents and with already this season their interchange has been impressive. Coutinho and Sturridge in particular have shown a willingness to drift away from their usual positions. Against Swansea and Southampton Moses and Henderson also demonstrated this trait and this is something Suarez can do extremely well. Last season, before his suspension, he was forming a really interesting partnership with the likes of Sturridge, Coutinho and Stewart Downing. Liverpool’s front three (rather than a front four) interchanged with great fluidity and it was a nightmare for opposing defenders because their man-marking became irrelevant. Putting Suarez behind Sturridge with Moses and Henderson out wide will have all four attackers capable of freely interchanging, a mouth-watering attacking prospect indeed. Rodgers will have a big decision on his hands about whether or not to unleash Suarez in this game. The Uruguayan’s relationship with United is fractured at best ever since his run-in with Patrice Evra, who may well not feature. Playing Suarez could provoke a tremendous performance from the forward but equally a volatile situation with huge potential to backfire, but deep down he will know it is the type of fixture Suarez will relish, unlike a behind-closed-doors match with Burnley. Goal Line Technology : Opening Pandora’s Box? Are Manchester United fans going overboard with the supposed superiority of Januzaj over Sterling?